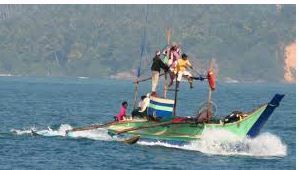 STORY: Sri Lankan navy on Tuesday (April 09) apprehended four Indian fishermen for allegedly poaching in its territorial waters. The arrests were made after the fishermen were found fishing near the Neduntheevu Island in Sri Lanka, said media reports. State Secretary, Tamil Nadu Sea Workers Association, Muruganandan said, the fishermen along with the confiscated boats had been taken to Kankesanthurai for interrogation. India shares an expansive oceanic border with Sri Lanka without any perceptible demarcation and fishermen on both sides ignore rules while netting their catch. Sri Lanka has long fumed over poaching and illegal fishing by Indian fishermen that it says depletes the catch of its own fishermen. Fishermen from both countries frequently stray into each other’s territory and end up spending years in jails. The U.N. Convention on the Law of the Sea states that fishermen who cross territorial waters can be warned and fined but not arrested.